Audi’s race-bred S8 supercar heads up an impressive display of performance cars at this year’s Melbourne International Motor Show. Making its Australian premiere at the Melbourne International Motor Show, the all-new Audi S8 is a car that clearly deserves its top-shelf reputation. 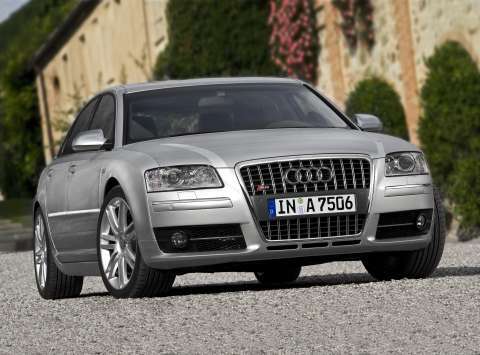 Due for local launch around November 2006, the new Audi S8 will be priced around $250,000. A sports car of the very highest calibre, the Audi S8 represents supreme athleticism, thanks to its race-bred V10 FSI engine, dynamic suspension and contemporary design, as well as exclusivity and superb luxury. Where the new Audi A8 set the benchmark for sports luxury performance, the new S8 takes this claim even further with its brand new 331 kW V10 engine. Capitalising on the expertise of the Lamborghini Gallardo super sports car, this ten-cylinder engine delivers 331 kW (450 bhp) at 7,000 rpm and 540 Nm of torque – the latter available from just 3,500 rpm – from a capacity of 5.2 litres. As on the Le Mans winning R8, the most successful racing car in the world, FSI petrol direct injection assures superior power output in the Audi S8. This luxury saloon sprints from 0 to 100 km/h in 5.1 seconds, and is electronically governed at 250 km/h. 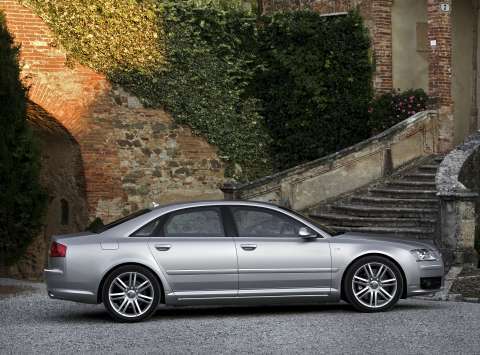 The driveline and aluminium chassis of the S8 have been modified to suit the engine’s power. The latest generation of quattro permanent four-wheel drive, with asymmetric/dynamic torque split, transmits this power to all four wheels. The firmer settings of the ‘Adaptive Air Suspension – Sport’ and a more direct steering ratio ensure that the power and dynamism of the drivetrain are transmitted to the road with precision and feeling. The S8 is equipped with a six-speed tiptronic transmission. The final ratio of this automatic transmission is lower than on the A8, its management is optimised to change gear more dynamically. The design of the new S8 completes the picture – Audi’s sportiest top model even has the looks of the most athletic luxury saloon car. Its front end carries the Audi single-frame grille with ease, bearing the S8 badge, and comprising vertical struts with a chrome-look finish. Three flat air inlets accentuate the front apron and the large inlets under the headlights feature a honeycomb-pattern grille. Badges on the front wings, door handles with aluminium trim strips and aluminium-look mirror housings are indications of the exceptional status of the S8. The tail of the S8 has a rear spoiler integrated into the luggage compartment lid and the exhaust system features four oval tailpipes. There is also an atmosphere of luxurious elegance inside the car. The door sill trims are adorned with S8 emblems, the inlays are in brushed aluminium and carbon. The leather multifunction sports steering wheel has colour-contrasting stitching and S-badging and the shift paddles have an aluminium-look finish. The needles on the instrument dials are in white, their scales in light grey and their digits in italic script. The Valcona leather sports seats are finished in a two-colour look. Generous equipment, including the headlight technology known as adaptive light and Audi advanced key, ensure the S8 is a technology leader, enjoying an exceptional position compared with the competition. One particular highlight that is available as an option for the S8 is the Bang & Olufsen Advanced Sound System. The fully digital system from the Danish high-end manufacturer integrates 14 active speakers, each energised by its own output stage. Two amplifiers provide more than 1,000 watts of power. The front tweeters use what is known as Acoustic Lens Technology, and act as point sound sources.